First things first – What is an H11 bulb? Which headlight bulb is the brightest? How many lumens is a standard H11 bulb? Is H11 same as 9006? What are the best LED headlight bulbs? Headlight bulbs are among the most significant parts of your car. They do not just add an aesthetic appeal to your car but are also important when it comes to your safety. While many automotive manufacturers are installing high-end headlight bulbs on the latest car makes and models, many car owners are switching to cheaper bulbs for replacement, without looking at their features. Even if the inexpensive bulbs work, they will not perform as well as the original bulbs. So, instead of saving money, you should pay more attention to finding the right H11 bulb for your car. In this guide, we’ll discuss H11 bulbs in detail. We’ll also list some of the best H11 bulbs on the market to help you make an informed purchase. All the 5 products have been tested by our automotive experts and have been rated high by existing customers. Let’s look at the products one by one. When it comes to the best automotive brands on the market, Sylvania is a world leader in manufacturing automotive lights for the aftermarket and OEM. 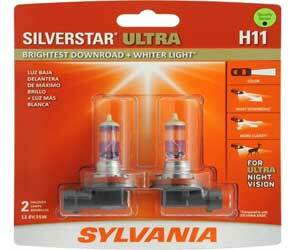 Sylvania H11 SilverStar Ultra bulbs are one of the brightest, power-packed halogen H11 bulbs on the market. They can be used as a low beam, high beam, and fog light bulbs. The patented tri-band technology helps in providing the brightest white light as compared to other H11 bulbs on the market. They also come with filaments with unique designs and are enclosed in a special gas mixture. The result – enhanced down road and side road visibility and better contrast. The only negative points are that their lifespan is short and they’re somewhat expensive as compared to the other H11 halogen bulbs on the market. Also, make sure you change the bulbs in pairs for premium visibility. 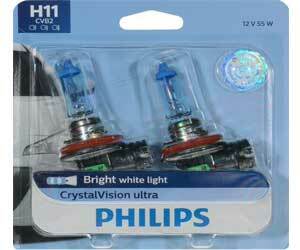 Philips H11 CrystalVision Ultra Upgrade Bulb has passed the requirements of the Department of Transportation which implies that it is legal on the streets. Since it is a 4000K bright white light bulb, it can be a great option. You will get enough white light you need on the road, especially during nighttime. The blue cap on the head of the bulb provides a cool blue effect which makes the white light somewhat warmer, especially during daytime driving. So, if you’re on a shoestring budget, we highly recommend purchasing Philips H11 CrystalVision Ultra Upgrade Bulbs. For a popular brand, the price is very reasonable. Pro tip: Make sure you replace the bulb in pairs for uniform light beams. The headlight may become a little dim with time. Also, when installing new bulbs, do not touch the bulbs with your bare hands. Always hold them with a rubber glove or paper. OPT7 FluxBeam H11 bulb comes with compelling features and provides you with brightness that remains unmatched. The most striking feature of the bulb is the Arc Glass Technology which provides the bulb with a significant advantage over its competitors on the market. The technology helps the light form a high-density pattern to prevent the occurrence of dark spots. Another excellent feature is the Dual Speed Turbo Fan which is fused in the FluxBeam. It provides a flow rate that’s twice better than what you would expect from most other H11 bulbs. Another exceptional feature is the Red Line Control Drive which is the heart and mind of the bulb. It is designed using a highly-efficient chip that can control a variety of functions of the light. It also helps in optimizing light output and improving heat protection. SNGL Super Bright LED H11 bulbs are brighter than many LEDs and halogen bulbs on the market. The crystal clear 6000K bright white light helps a great deal in driving at night, without any glare issue. So, you can see better, farther, and brighter. Not only this but the bulbs come with over 50,000 hours long life. SNGL’s Intelligent Constant Cooling System leads to constant cooling of the LED bulbs and ensures superior light quality. Other compelling features of the bulbs include IP67 rain-resistant build, LED drivers with heat-resistance, and fan-failure protection. You can use SNGL H11 bulbs for low beam, high beam, motorcycle light bulb, and fog lights. The adjustable beam technology also allows you to adjust the beam intensity for optimal output. Beamtech H11 LED bulbs come with the latest Korean CSP LED chips that produce 8000 lumens output. They’re extremely bright for comfortable and safe night time driving and brighter than halogen and HID bulbs. Each bulb comes with a lifespan of over 30000 years. The drivers are certified IP65 waterproof and heat-resistant. The light beam pattern is good with a thin strip of the light emitting surface, almost similar to the halogen design. The hard aluminum design provides excellent heat performance and heat dissipation mechanism with outstanding thermal conductivity. When it comes to health and safety, you’ll never notice high voltage, large current startup, electromagnetic radiation, etc. The bulb set up does not contain a fan, and the installation is simple. All you need to do is just plug and play the H11 bulbs. An H11 bulb is a type of filament lamp fitted in a car headlight. It is typically seen in fog lights. The H11 bulb is perfect for driving at night as it provides excellent illumination and keeps you safe on the road. Since normal headlights are not enough for nighttime visibility of the road, you need fog lights with H11 bulbs. If you’re looking for the best H11 bulb for your car, it’s important that you know the types of H11 bulbs on the market to find the most suitable one for your vehicle. LED H11 bulbs are popular among designers because of their size. Since these bulbs are thin, they can be used for a variety of headlight designs. Even though they are not as bright as HID bulbs, they achieve full brightness within seconds after switching them on. Their most significant benefit is their energy efficiency. But, the high cost can be an issue for some car owners. When it comes to buying the best H11 bulb, halogen bulbs are loved by one and all. They’re simple, reasonably priced, and can with a long-life of up to 1000 hours. However, there’s one issue with these bulbs. While they give out bright light, they can easily get heated. They can also be contaminated easily a variety of substances and are quite fragile. So, you need to be very careful while handling them. There’s no H11 bulb that can beat the energy-efficiency of the HID bulbs. They’re made of a combination of rare metals and gases. HID H11 bulbs can last for over 2000 hours and produce brilliant brightness. And, the best thing is that the power consumption is minimum, typically only 35 watts. Since they’re extremely bright, these bulbs can be an issue during the traffic-heavy hours. They’re also expensive than the halogen bulbs. SNGL Super Bright LED Headlight is the brightest H11 bulb on the list above. Thanks to the LUMILED customized double-sided LED chips, the bulbs boast a maximum output of 6200lm in 6K color temperatures. The output of a standard 55W H11 bulb is 1200 lumens with a +-15% variation. So, the output for a standard H11 bulb can be anywhere between 1000-1380 lumens. No, H11 and 9006 are different. Even though they’re similar in size, the base is different. On the one hand, a 9006 bulb contains a bulb, rubber seal, locking tabs, and connectors (in the same order), and on the other and, an H11 bulb contains a bulb, locking tabs, rubber seal, and connectors (in the same order). 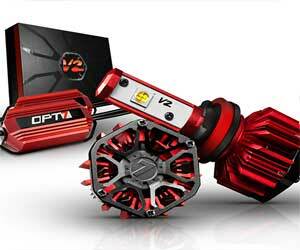 The best LED headlight bulbs are OPT7 FluxBeam, SNGL Super Bright, and Beamtech. Compatibility – Before purchasing H11 bulbs, make sure you check the fitting and size to see if the bulbs are compatible with your vehicle’s make and model. Of course, the bulb should have an H11 plug and the perfect measurements to fit well. Some bulbs do not come with a cooling fan that occupies ample space on the exterior, while the others come with cooling fans that do not allow the bulbs to fit properly. Brightness – It goes without saying that bright H11 bulbs are better than the dim ones. Therefore, it’s important to consider the brightness of the bulbs measured in lumens. The best H11 bulb will have the highest lumen output as it will help a lot during night time driving. However, make sure the light does not cause unnecessary glare to bother the incoming traffic. Buy H11 bulbs with technologies that focus the beam of light on a smaller area. Color temperature – 3000K to 4500K is yellow light; 4500K to 5000K white light; 5200K to 5800K is pure white color; 6000K and above is the white color with a blue tinge to make it a cool white color. With different types of H11 bulbs on the market and each having a variety of features, it’s a daunting task to find the best H11 bulb for your vehicle. While each manufacturer claims their product is different, it’s up to you and the existing customers to decide. Based on first-hand testing and the average customer rating, our experts have declared Beamtech H11 LED Headlight bulb as the clear winner. LED bulbs are brighter, more energy efficient, last longer than halogen and HID bulbs, and produce very little heat. Beamtech H11 bulbs have over 3000 customers reviews online and have been rated high by existing customers. The bulbs are bright and suitable for night time driving. And, above everything else, unlike many other branded LED H11 bulbs, they’re easily affordable. We sincerely hope you found our guide to the best H11 bulb helpful. If you have any other queries, you can post them in the comment section below. Our experts are always ready to help you. What is an H11 bulb?